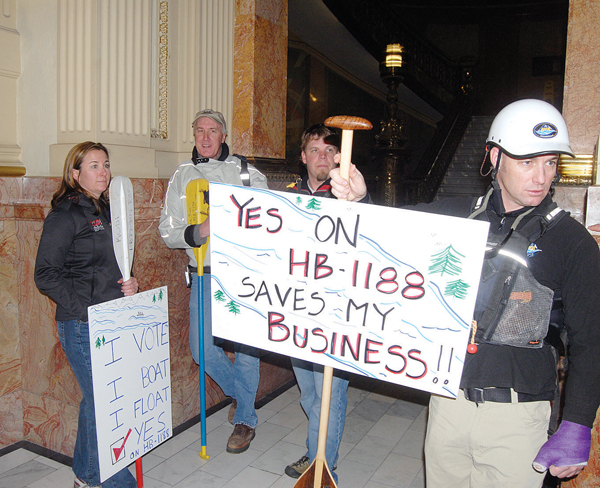 DENVER – An effort in the state Legislature to clarify rafters’ rights to float Colorado’s rivers is encountering rough waters in the Senate. House Bill 1188, which passed out of the state House of Representatives last month, ensures that commercial rafting companies can legally raft on historically floated stretches of river without fearing trespass charges. The bill is slated for a hearing in the Senate Judiciary Committee in mid-March. Summit County resident Duke Bradford, owner of Arkansas Valley Adventures, has been active in drumming up support for the measure. The bill’s author, Rep. Kathleen Curry of Gunnison, believes the controversy is unwarranted. She intends to simply clarify existing law, but the bill has sparked a debate over private property rights. She wants people – senators and anyone interested – to simply read the wording. The bill would explicitly allow commercial boats to make incidental contact on river banks and bottoms, even when a river is flanked by private property. Commercial boaters would also be allowed to conduct emergency portages when they encounter bridges, unnavigable rapids or other hazards. The bill’s opponents say it would violate their rights as private property owners, giving rafters access to their lands. “It comes down to privatizing your rivers and whether the public has a right to float. If there’s a taking here, it’s the public that’s being taken from,” Bradford said. Curry said she believes the bill’s foes are making a strategic mistake if they kill the bill. They know what they are getting with her bill, she said. Commercial outfitters will likely force a ballot initiative if the bill fails, and no one can be certain whether it would be as narrow as what Curry is seeking. Curry’s bill only applies to commercial outfitters, not to the average recreational boater with his or her own raft. And it only addresses stretches of rivers that have a history of commercial rafting – not to those that haven’t yet seen much commercial activity. According to Bradford, river outfitters have already taken the steps necessary to go to the ballot, should the bill fail. “We’re going for the right to float on all rivers. If the legislators say they don’t believe the law gives us the right to do this, it’s time for us to change the law,” Bradford said.